"Diese funf sympathischen englischen Beater bereiten uns und sich Kummer. Uns, weil wir noch einige Zeit auf ihre neue Single warten mussen. Sich, weil ihnen kein Song gut genug fur ihre Fans ist. Unser Trost: die Hollies' LP "Butterfly" ist einfach fabelhaft." If anyone can translate that, I'd appreciate it! P.S. Check out those outtasite boots, girls! This magazine is known for its great photo layouts. They printed some wonderful shots of the Rickfors lineup, too. This is so fantastic!!!!!!!!!!! 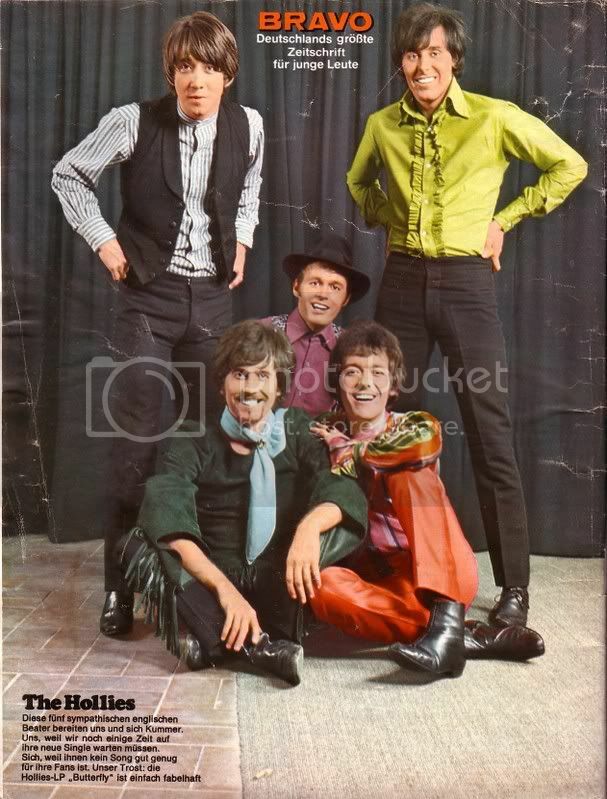 !The Hollies in technicolour, WOW.My eyes are just recovering ,shades at the ready!Bernie looks class in this pic,so suave .I'm developing a real soft spot for this guy .But don't worry Allan"I'll be True To You"always!Our Mr.Clarke looks like a stick of rock in this colourful outfit.And NO I'm NOT going to make some sordid comment about licking him !Seriously his smile here would brighten up the darkest days of winter.It is so beautiful .The rest of the guys just look so happy and together here .Tony is wearing my fav shirt,that lovely stripey one,and Graham has more fringes that a whole hairdressing salon!!!!!!!!! !Thanks Queenie ,you have surpassed yourself here . You are a real gem, what a cool looking bunch of lads. "These five likeable English beaters prepare us and themselves for some grief. It is because there will still be some time to wait for their new single. To them no song isn't good enough for their fans. Our consolation: the Hollies' LP "Butterfly" is simply fabulous." Bloomin' 'eck, was fake tan invented in '68? You're welcome, hon! It's always fun to find and post new pictures of our favorite guys! I've seen Allan wear that same rainbow-striped shirt on the cover of a German-issued EP. I'll see if I can find the photo somewhere. You're right, Bernie is so stylish in this one, and I also love Tony's striped shirt. He's probably trying to keep a straight face because the photographer said something rip-roaringly hilarious! Let's not forget Bobby, handsome as always with that purple shirt and trademark black hat! I love the way Allan leans on Graham in this pic. You can plainly see how close they were. I'm so jealous of Graham, as you can see! Stick around. There's more to come! To Anthony: Thanks so much! You're so sweet! To James: Fake tan must have been around by then, because how can you explain Bernie, Bobby, and Tony's beach baby look? Another gorgeous photo! With the tan and the ruffled shirt, Bernie looks like he's ready to compete on "Dancing with the Stars"
I'll gladly dance with him! Then again, I'll have to wait my turn! Wouldn't mind a bit of Cha,cha,cha!with those guys .Move over Marie Osmond . I'm not much of a dancer, but I'll brave it just to dance with these guys! Thankyou Vrinda for another great photo - it's one of the best pictures I've seen of the guys. They all look great and look like they were having a good time together. Love Bernie's puffed up shirt which real suits him.